The story seems to be that he was standing in the busy Maths corridor holding his phone to check a message, between classes (which Charlotte assures me you're not allowed to do! ), when an s5 kid, who was rushing to class, tripped over his own shoe and went flying smack into Léon's arm and thumped him against a wall, quickly apologising and carrying on his way, as did Léon, who hadn't realised the enormity of what had just happened. When was this? 10am!!!! He said the pain kicked in half an hour later so he asked his PE teacher if he could be excused from his social dancing class and sit and watch, after that it didn't occur to him to go to the medical room, have anyone call me or even ask a teacher what the best plan of action was... It was my left hand and I'm right handed so I didn't think breaking your arm was a reason to ask to go home! Give me strength! So I dropped off the girls and went to the Vicky where they confirmed he had a 'buckle fracture' which would probably take three weeks to heal. At first his main worry was that they might make him sit out social dancing and he didn't want to miss the opportunity to 'get the girls' sympathy!' (like brother, like brother 😉). 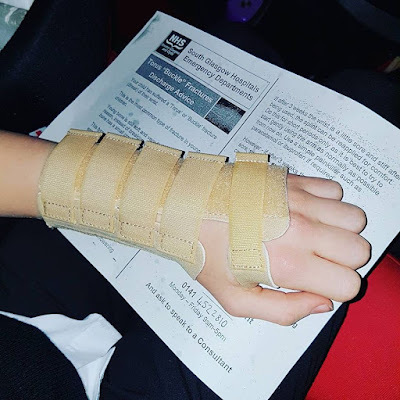 It turns out they are trialling putting splints rather than plaster casts on them as they are short lived and not too dire, but I expect that isn't the best situation to be in with fifteen days to go to his orchestra Xmas performance - he'll be the first one-handed first violin in the junior orchestra's history - sigh. Mind you it apparently holds his wrist in 'waltz position' so he's pleased! To cap it all, we don't even get the benefit of a long lie for the first time in five years of Saturday school when he misses his lesson tomorrow as it's the primary school winter gala day and Anna's choir is performing at that!